My niece and 2 nephews moved to Texas a couple weeks ago... our family misses them soooo much! This week they have to start at a new school so I decided they needed a little care package from their Aunt Jenni. 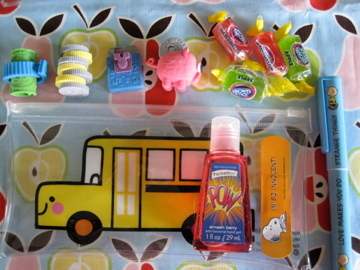 I bought the little pencil pouches at Joann's and filled them with bandaids, candy, erasers and other cute stuff. Then I made some little notes to go with the presents. I had cute little waxed paper bags so I cut the notes to go inside. and they were ready to be sent on their way. Do you have any kids starting school this week? Aw... what a sweet little gift you've sent. Thanks for linking this post up to Share the Love Wednesday! Everything you touch is amazing!! So cute and thoughtful. Thanks for the inspiration! !